Eternal Haunted Summer: If you could correct one common misconception about Wicca, what would it be? Elissa Wilds: Unfortunately, some people still associate it with Satanism. Popular movies often capitalize on this misconception for the “fright factor.” Satan is a Christian construct. Wiccans can’t worship something they don’t believe in. EHS: How did you come to Wicca? And do you follow a particular tradition? EW: I’ve explored everything from Christianity to Buddhism to New Age philosophies. I tend to pull from different belief systems and integrate the common threads that make sense to me. I always strive to come at anything and anyone from a space of love and non-judgment, while still being true to myself and honoring each individual’s unique path. I’m not perfect, and I’m still learning. Wicca is the religion that I’ve found most closely aligns with this way of being. I don’t follow a particular tradition. Spiritually, I’m eclectic. EHS: What do you find so compelling about paranormal romance as a genre? What draws you to it as a writer? EW: Our lives are so busy, so filled with “stuff to do” that it can take a really engaging, engrossing tale to draw us out of the mundane world so we can put our worries aside and just enjoy the ride. Paranormal stories allow us to lose ourselves in the fantasy elements, I think, in a way that goes beyond what non-magical stories allow. As for me, I get to use my imagination to its fullest while slipping in bits of what I like to think of as “real magic.” And the only thing I enjoy as much as a paranormal tale is a good love story. Combining the two just made sense for me. EHS: Your short story “In Dreams” is part of the Mammoth Book of Paranormal Romance 2. How did you come to be involved in that project? EW: My agent was approached by the editor of the Mammoth Books, Trisha Telep. 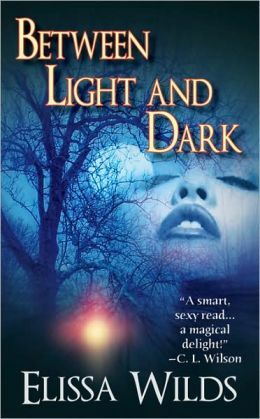 EHS: Your paranormal romance Between Light and Dark includes Axiom, who is a gray God. What is a gray God, and how did you come up with that idea? EHS: Darkness Rising, the sequel to Between Light and Dark, focuses on Aurora, an Earth Balancer. How does an Earth Balancer fit into the conflict between the Light Realm and the Umbrae? EW: Aurora is half human-witch/half gray god. She literally balances the energies of light and dark on planet Earth. She is key to keeping the Umbrae (the evil beings trying to corrupt humans) from infiltrating the light realm. EHS: What is your forthcoming series Secrets of Shambhala about? EW: A small, southern town of psychics and mediums that finds itself at the center of a battle for Earth that’s been brewing for eons. Disgruntled ghosts are the least of their worries! Each book centers on a particular hero/heroine recruited to protect and defend the town and on a larger scale, the world. And of course, there is a love story at the heart of the books — a love story between hero/heroine, the love of their quirky town, and love for the rest of us, too. I’m having such fun with this series (as you can probably tell) ! EHS: What kind of research goes into your stories? Do you have a big stack of books on your desk? EW: I have bookcases and bookcases of books. I ran out of room and had to streamline my research library a bit, though, so it’s not quite as impressive as it used to be. My research involves reading a lot of books on metaphysical subjects. I also try to attend seminars and workshops on the various themes so that I can lend authenticity to the magical topics in the stories. I’ve learned a lot and had a lot of fun along the way. One of my most memorable experiences was a live ghost hunt at a very active historical site in Florida. EHS: What advice do you have for other authors, particularly those who write paranormal romance and are trying to break into the publishing scene? EW: Write what you’re excited about. Write what draws you. Don’t write vampires just because that’s what everyone else is doing and you hear it’s “hot.” By the time you catch a trend, it’s winding down. Then the next “big thing” comes along. Just keep writing and eventually, with time, honing your craft, and perhaps a bit of luck, your work will find a home. EW: Right now they can be purchased on my website www.elissawilds.com or on Amazon.com. “In Dreams” is also available on Barnesandnoble.com. Feel free to check my website for updates in this regard. EHS: Which books would recommend to those new to paranormal romance? Which titles are among your favorites? EW: This is soooo tough. Eeeegads! I love anything by C.L. Wilson (fantasy romance) or by Kresley Cole (paranormal romance). Also, Julie Leto’s Phantom series is awesome. For young adult paranormal books, Carrie Ryan’s Forrest of Hands and Teeth and Diana Peterfreund’s Rampant are particularly imaginative and engaging. (And my fourteen year old agrees wholeheartedly). I know I’m forgetting something or somebody here so, I apologize to those people in advance. I just love so many books and so many authors! EW: I’m finishing up the 3rd book in The Hidden Circle Coven series, Darkest Before Dawn. Book 1 of Secrets of Shambhala is done and should be available soon. I’m working on the second book in that series. I’m also in the middle of a couple non-fiction projects. EHS: Which book fairs, conventions, or oner events will you be attending in the foreseeable future? EW: I’ll be at the RWA National Conference in July 2013 (Atlanta, GA), and New Jersey Romance Writer’s Conference in October 2013. I’m still finalizing my schedule, but have a few other events on the horizon. I update my website with appearances.